Cobblers boss Keith Curle has praised his players for their ‘spot on’ reaction to last weekend’s defeat to Port Vale and his subsequent post-match outburst following Saturday’s 2-2 draw at Notts County. Curle laid down a challenge to his squad in the wake of their ‘shocking’ 2-1 loss to 10-man Port Vale, demanding to see an improvement in training and on the pitch, even calling his players in at 9am every day last week. He coaxed a better performance out of them at Meadow Lane on Saturday although once again they couldn’t capitalise on having an extra man as Kane Hemmings rescued a point for the struggling Magpies after goalkeeper Ryan Schofield saw red a minute into the second-half. Daniel Powell had earlier cancelled out Mitch Rose’s sweet strike in the opening period before Sam Hoskins’ free-kick gave Town a 2-1 lead, only for Hemmings to tap home Jon Stead’s low cross two minutes later, with the visitors then missing a bucketload of chances to take victory. There may have been fears that players would ‘down tools’ after being so heavily criticised in public by their manager but, with games running out this season, it appears Curle has got the response he desired. “I thought the focus was excellent and I’ve got to say the players have had a good week and the reaction has been absolutely spot on,” he said. The free-kick manoeuvre is something we’ve worked on because a lot of teams just expect us to put the ball into the box for the big lads so we caught them cold with that one. “They responded to me personally very well. They changed their routines, and the focus and mindset of the players has also changed. “The training has been intensified but it’s been a gradual build-up towards the game on Saturday and the message started very early on in this week. Cobblers had numerous opportunities to turn one point into three at Meadow Lane, including a crazy goalmouth scramble that saw Dean Bowditch have one effort saved and two cleared off the line while Sam Hoskins also saw a shot blocked, all in the space of 15 seconds and all from a well-worked free-kick routine. 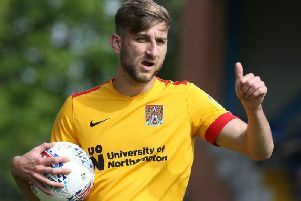 Hoskins volleyed another glaring chance straight at substitute goalkeeper Ross Fitzsimons from just six yards out as Northampton were ultimately held to their 17th league draw of the season, the most in the division. “You couldn’t wish for a better opportunity just on the edge of the six-yard box with an open goal and he made good contact,” Curle added. “The free-kick manoeuvre is something we’ve worked on because a lot of teams just expect us to put the ball into the box for the big lads so we caught them cold with that one.